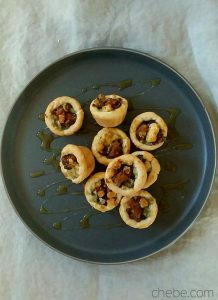 If you have never tried the combination of flavors that are brought on by walnuts, dates, cinnamon and Gorgonzola cheese, then you are in for a treat with these tartlets cupped in gluten and grain free Chēbē dough. It is truly an extraordinary medley of tastes! We can assure you that it will be difficult to stop at only one when popping these lovelies in your mouth. Naturally gluten and grain free Chēbē dough is remarkable to work with for this type of baked delicacy. 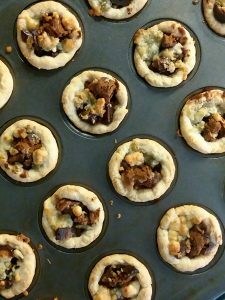 We encourage you to go all out with this recipe, but if you have a different tart one that you favor, then use the dough recipe here and have at it! 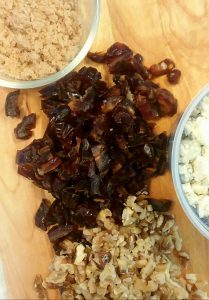 In a bowl, stir together the Chebe mix, and sugar. Continue blending in the egg, milk and butter. Mix it well. Knead it with your hands until the dough is smooth. (Add a tsp of milk if it feels too dry.) This makes about 14 oz of dough. Separate the dough into 24 equal pieces. 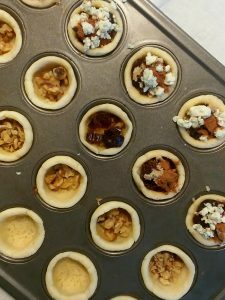 (If you have a scale, each dough piece will weigh about 0.6 oz, or 16 g.) Drop each piece into the cups of an un-greased mini muffin baking tin. 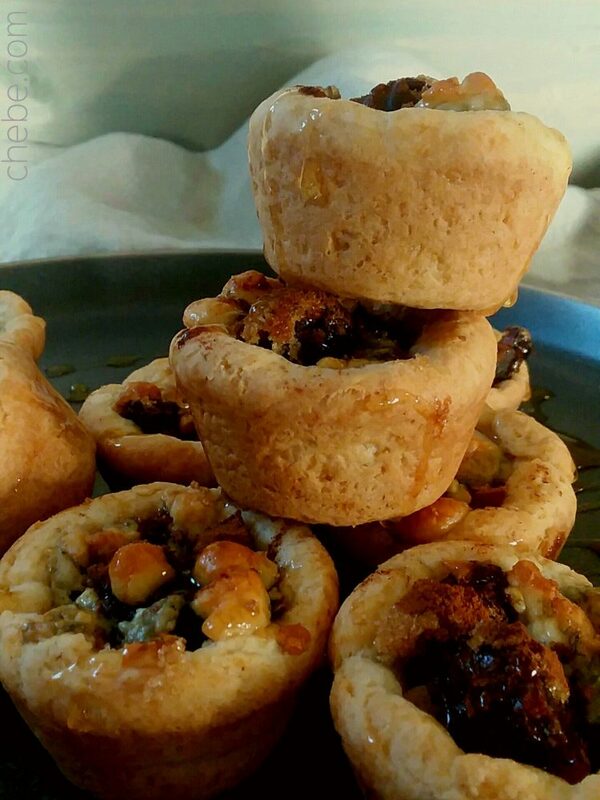 With your fingers, press the dough into the muffin cups. Be sure the dough covers the entire cup, even exceeding the top a little. 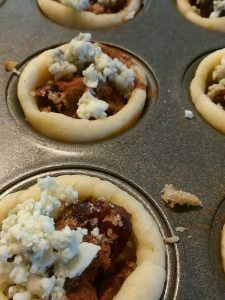 With the tines of a fork, poke holes in the base of the cups to prevent the dough from puffing. Fill each cup with walnuts, dates, and brown sugar. Sprinkle with cinnamon and top with a few crumbles of cheese. The cups should be filled just over the tops. Bake for 10 minutes. 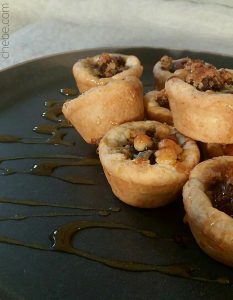 Remove the tartlets from the tin and drizzle with honey. Serve warm. These may be frozen in an airtight container. To serve, let thaw and reheat at 425F for 5 minutes. Check out Chēbē All Purpose Mix and Check out Chēbē Original Mix here.